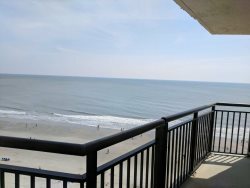 Ocean front one bedroom at BlueWater 1001B! This is a 11th floor pool and ocean view unit at the Landmark Resort! The studio is furnished with two full sized beds, full bath, a wet bar and a private balcony with ocean view. The wet bar area includes a sink, cabinet space, a microwave and a mini fridge! Its a perfect condo with a beach view. Everything was clean and neatly laid out, and the host was always quick to answer any questions I had!